The failure to win a Super Bowl and losing twice in their first playoff game was enough for the Denver Broncos to fire Jon Fox, although everyone calls it mutual agreement. Peyton Manning playing injured in the divisional round loss and probably for the last month of the season didn’t really help him. But regardless of Manning now having an excuse for playing badly in the loss to the Indianapolis Colts, John Fox just didn’t get the job done for a team that was favored to beat the Baltimore Ravens two years ago and lost at home in overtime, favored to win the Super Bowl against the Seattle Seahawks and got crushed in front of the entire nation and then again lose after a bye week, at home, against a team the Broncos were favored to beat. Fox was the head coach of the Broncos four seasons. He always made the playoffs, always won the division. With Peyton Manning as his quarterback, the Broncos won 38 regular season games, but were only 2-3 in the postseason. The goal has always been winning a Super Bowl, and it felt as if the Broncos don’t believe Fox was going to win them one even before the postseason began. There was the mysterious report suggesting Fox will be available for hire should the Broncos lose to the Colts. The rumors pointed at Fox or someone from his surrounding actually leaking that bit of news, feeling like something was off already. The Broncos looked bad right from the start against the Colts, and never really looked close of making a comeback, as Manning kept missing receivers, looked slower and more immobile than usual and looked more like a guy who is done with this game than an MVP and all-time legend. In any case, when a coach leaves a team one day after losing, it means the ownership and John Elway have been thinking about this for quite some time, and were only looking for an excuse. Fox is now rumored to be the number one candidate for the Chicago Bears head coaching vacancies, with the positions available to him mostly left unmanned. The rumors about who comes in for him will soon begin. Peyton Manning was probably the player and person criticized the most after the loss to the Colts, but the writing was on the wall. His performances in the final month of the season weren’t just a matter of letting someone else carry the team’s offense; Manning was simply bad, or at least well below his usual level. According to Adam Schefter, Manning has been playing for over a month with a torn right quad, which explains his immobility and overall decline. This might also explain why Fox might have already been preparing for a departure, knowing very well that his quarterback with such an injury wasn’t going to suddenly come back together again and lift this team to a Super Bowl. 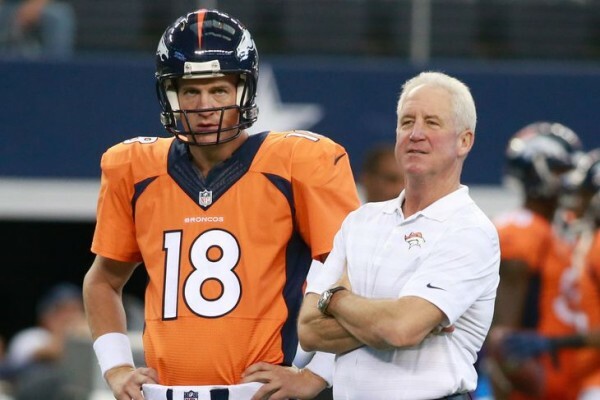 Manning is now considering retirement, or at least seems to be, but will wait until he actually announces what his decision is, maybe feeling that he doesn’t have it in him anymore to take a team to the Super Bowl.